Monster Arcade — that was the name of our town's local arcade and the amount of fun I had in there could only be accurately measured by its prices. It was the go-to place for kids and teens, as it was only a short jaunt from the local schools. Even though our district had their own after-hours activities, which were aimed at keeping students on the 'straight and narrow' most wanted to escape the place they had been for eight hours already. And what better place to go than to an arcade? So it was not uncommon for the building to be packed almost every day; the sounds of laughter, air hockey, and Mortal Kombat filling the air. And it was on these arcade machines that America was still doing battle with the nation's mightiest foe. An enemy that could only be combated by reaching the minds of our nation's youth warning them of the danger that faced them if they did not have their faces in front of these screens on a daily basis. 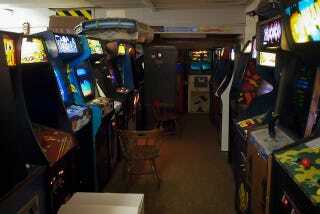 That foe was drugs, and without these arcades, we have failed America. In 1971, Richard Nixon declared that drugs abuse was 'public enemy number one', stating that more federal resources were needed in order to prevent more from falling prey to abuse and to rehabilitate those whom were already suffering at the hands of addiction. The media dubbed this the 'War on Drugs'. This so-called war led to the creation of Drug Enforcement Administration, which replaced the Bureau of Narcotics and Dangerous Drugs, as well as the formation of D.A.R.E., or Drug Abuse Resistance Education, which was aimed at 5th graders, with other programs that were directed toward 6th, 7th, and 8th graders. 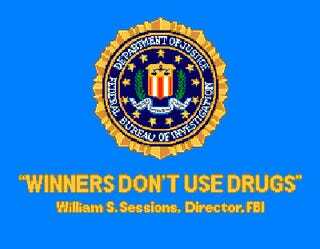 However, outside of school, the image that could be most associated with the 'War on Drugs' was a quote from FBI Director William S. Sessions that appeared on many arcade machines' Attract Mode: "Winners Don't Use Drugs". This slogan was included on all arcade cabinets that were imported to North America between the years 1989-2000, as Sessions reached an agreement with the American Amusement Machine Association to do so. For kids, whom spent their time at skating rinks and arcades, these splash screens, featuring this phrase, were what would be most memorable. While the slogan would never pop up during actual gameplay, it would however appear after someone inserted coins in order to play. And, when one would take a break to wipe sweat from their palms when given a break after some intense gameplay, they need only look over the vast amount of other machines to see the "Winners Don't Use Drugs" screen proudly displayed for mere moments before it was replaced with demo footage. Now, the American Arcade is all but dead, having hit its Golden Age in the mid-1990's and declining steadily from there, though there has been a resurgence to bring back the games of old. Without the arcade to tell kids that they shouldn't use drugs, because every one is a winner, we have begun seeing the legalization of marijuana in some states, with backing for more to do the same. But there is one game that has stayed true to the cause, even though the War on Drugs has failed and that game is Far Cry 3: Blood Dragon, which featured an homage to better times. If the death of the arcade had never come, America would still be proud of us. Without the wonderful blue image to stick in our minds on a daily basis, we lost sight of how important staying drug free is. Because a drug-free lifestyle is not just paramount to us, but to dead Richard Nixon, Lady Liberty, and our school resource officers who spent so much time telling us that drugs are bad, mmkay? When we lost the arcade, we lost a part of our society; a gap was left unfilled to remind us how we were winners, because we didn't use drugs. Then we all promptly filled that void with drugs. We have only ourselves to blame. Forgive us, arcades, we know not what we have done!